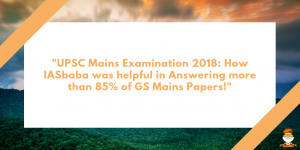 Home » Blog » 60 Days Plan: UPSC IAS Prelims 2019- Polity and Current Affairs (Day 38)-HANDLING THE FAILURE! At IASbaba, we don’t call ourselves teacher, rather ‘Mentor’ is what we are. As mentors, we try to bring in a positive change in the life of a student. We are closely associated with them, try to be there with each one of you in need. Apart from academics, students come forward to discuss their personal issues and problems and we are more than happy to assist. The final result of UPSC brings with it an array of mixed emotions. On one hand, our chest swells with pride when students call and mail us to share their success stories and revere us by acknowledging the role played by IASbaba in their success. On the other hand, we feel the pain of students who couldn’t make it despite putting in their best efforts. One such 3 am frantic call, made us write this article for all those who couldn’t make it this year or struggling with their preparation. “Sir, there is just darkness in front of me, I don’t know what to do, where to start from, I was so close but yet so far. My life hasn’t got any purpose now.” These were the exact words that were told in a chocked voice. All of those who are sharing the same feeling, first of all, please be calm. This is not the end of the world. Think about the moment, when for the first time you thought about preparing/appearing for Civil Services Examination. Half the battle was won at that very moment. Remember, it was your conscious and voluntary decision to start preparing for the toughest exam in India. You, yourself decided not to live a mediocre life and your work should have a meaning. You did not believe in a job, you believed in service (of course the prestige and perks are a part of that service). Knowing this, did you think that it will be a cake walk? Did you think that you’ll just appear in the exam and qualify? When you decided to prepare for CSE, you elevated yourself from the general social strata which are occluded by a veil of ignorance in the virtual reality it is living in. You are not a part of that society any more. You have taken a path where you are bound to be enlightened. Remember, this exam has been designed to fail the candidates, rather than to pass. And failure is just one part of this long journey. The journey is full of ups and downs. Highs and lows. Many a time, you feel a lot more energetic and indulge in studies for long hours of concentration, but at times you feel detached and disturbed. The journey of UPSC is an ego crusher. It tosses you up, throws you down, thrashes you and asks you, what exactly are you made of? And whenever this question is thrown at you, you should reply that you are a warrior. You might have lost a battle, but you will win this war. Also, there is a common feeling that despite getting very low marks in various test series in the market, my neighbour/friend got a rank, and I couldn’t qualify (human/natural feeling of being much better than him/her). You should remember that whoever has qualified, is worthy in the eyes of UPSC and its judgement should be respected. Only hundreds are selected every year in a crowd of lakhs, and probably it was not your time this year. You can not eliminate that element of luck. What you can however do, is to have faith in you. Dust yourself up and get ready for another attempt to a very prestigious prize of rank 1. Do not aim for less than that, as you deserve the best. You are not a new candidate and you don’t have to start right from scratch. You can revise the static portion entirely in a matter of couple of weeks and it’s just the current affairs that need to be taken care of. There is still more than a month left and it is more than sufficient time for you to turn the tables. You don’t have to compete with others, but yourself. Be better every single day and learn something new. There are many candidates who top this exam in their last attempts. It is just a matter of time and you will be in the list too. Don’t forget that we are there for you. If you need any guidance or counselling, feel free to write to us. Last but not least, be perseverant and have confidence. Keep telling yourself, that if you won’t qualify, who else will. Prepare a plan for the coming days. Go through the 60-day plan diligently and cover DNA/Monthly Magazine and daily current affairs quiz. If you are ILP/AIPTS student, then revise babapedia, VAN and the questions of the test series. Make us and yourself proud. Have a successful journey. Q.1) Which among the following can happen during an Emergency under Article 352? During an Emergency, the Central government becomes all powerful and the states go into the total control of the Centre. It converts the federal structure into a unitary one without a formal amendment of the Constitution. This kind of transformation of the political system from federal during normal times to unitary during Emergency is a unique feature of the Indian Constitution. Parliament becomes empowered to make laws on any subject mentioned in the State List. Although the legislative power of a state legislature is not suspended, it becomes subject to the overriding power of the Parliament. Thus, the normal distribution of the legislative powers between the Centre and states is suspended, though the state Legislatures are not suspended. In brief, the Constitution becomes unitary rather than federal. The President can proclaim a national emergency only on the advice of the prime minister or the cabinet. Under Article 352, the President can declare a national emergency when the security of India or a part of it is threatened by war or external aggression or armed rebellion. It may be noted that the president can declare a national emergency even before the actual occurrence of war or external aggression or armed rebellion, if he is satisfied that there is an imminent danger. The President can also issue different proclamations on grounds of war, external aggression, armed rebellion, or imminent danger thereof, whether or not there is a proclamation already issued by him and such proclamation is in operation. However, the President can proclaim a national emergency only after receiving a written recommendation from the cabinet. This means that the emergency can be declared only on the concurrence of the cabinet and not merely on the advice of the prime minister. The 44th Amendment Act of 1978 introduced this safeguard to eliminate any possibility of the prime minister alone taking a decision in this regard. Q.3) In which among the following case, the Supreme Court held that the proclamation of a national emergency can be challenged in a court on the ground of malafide or that the declaration was based on wholly extraneous and irrelevant facts or is absurd or perverse? It was in the Minerva Mills case (1980), the Supreme Court held that the proclamation of a national emergency can be challenged in a court on the ground of malafide or that the declaration was based on wholly extraneous and irrelevant facts or is absurd or perverse. The proclamation of Emergency must be approved by both the Houses of Parliament within six months from the date of its issue. The Rajya Sabha can approve a proclamation of emergency under the Article 352 of the Constitution for a period of six months when the Lok Sabha remained suspended. The proclamation of Emergency must be approved by both the Houses of Parliament within one month from the date of its issue. Originally, the period allowed for approval by the Parliament was two months, but was reduced by the 44th Amendment Act of 1978. Emergency is imposed for an initial period of six months and can last for a maximum period of three years with repeated parliamentary approval every six months. Q.5) President’s rule can be imposed on a State if? The article 356 of the constitution which focuses on the failure of the Constitutional machinery of the State is often termed as the President’s rule. The failure of the State government to function as per the constitution is the first step towards this. Other factors include the loss of majority, break down of law and order, indecisive outcome of elections, no alternate claimant to form the government, insurgency, defections and break-up of coalition. It can be imposed initially for a period of six months. Q.6) By which of the following respect/s, a resolution of disapproval is different from a resolution approving the continuation of a proclamation? The first one is required to be passed by the Lok Sabha only, while the second one needs to be passed by the both Houses of Parliament. The first one is to be adopted by a simple majority only, while the second one needs to be adopted by a special majority. Q.7) Which among the following statements is/are true with regard to President’s Rule (Article 356)? Every resolution of Parliament approving its proclamation or its continuance must be passed by a special majority. It has no effect on Fundamental Rights of the citizens. There is a maximum period prescribed for its operation, that is, three years. It can be proclaimed when the government of a state cannot be carried on in accordance with the provisions of the Constitution due to reasons which may not have any connection with war, external aggression or armed rebellion. During its operation, the state executive is dismissed and the state legislature is either suspended or dissolved. The president administers the state through the governor and the Parliament makes laws for the state. In brief, the executive and legislative powers of the state are assumed by the Centre. There is a maximum period prescribed for its operation, that is, three years. Thereafter, it must come to an end and the normal constitutional machinery must be restored in the state. Every resolution of Parliament approving its proclamation or its continuance can be passed only by a simple majority. Special majority is needed in case of Article 352 National Emergency, hence, statement (1) is wrong. It can be revoked by the President only on his own. Q.8) Which among the following statements about National Green Tribunal is/are not true? The NGT has been established for effective and expeditious disposal of cases relating to environmental protection, conservation of forests and other natural resources. In India, NGT was established in 2010 under ‘Article 49’ of the Indian Constitution. NGT is a body composed of judges and members with expertise in the field of science and environment. The above-said act was enacted under constitutional provision of Article 21, which assures the citizens of India the right to a healthy environment. Hence, statement (3) is not true. The NGT is not bound by the procedure laid down under the Code of Civil Procedure, 1908, but shall be guided by principles of natural justice. It is responsible for enforcement of any legal rights relating to environment and also gives relief and compensation for damages to persons and property. The Chairman of the tribunal is required to be a serving or retired Chief Justice of a High Court or a judge of the Supreme Court of India. Members are chosen by a selection committee (headed by a sitting judge of the Supreme Court of India) that reviews their applications and conducts interviews. The Judicial members are chosen from applicants who are serving or retired judges of High Courts. Expert members are chosen from applicants who are either serving or retired bureaucrats not below the rank of an Additional Secretary to the Government of India (not below the rank of Principal Secretary if serving under a state government) with a minimum administrative experience of five years in dealing with environmental matters. Or, the expert members must have a doctorate in a related field. When it is imposed in a state, the Parliament becomes empowered to make laws with respect to any matter in the State List in relation to that state. The laws become inoperative on the expiration of six months after the president’s rule has ceased to operate. When the President’s rule is imposed in a state, the Parliament becomes empowered to make laws with respect to any matter in the State List in relation to that state. A law made so by the Parliament continues to be operative even after the president’s rule. This means that the period for which such a law remains in force is not co-terminus with the duration of the President’s rule. But, such a law can be repealed or altered or re-enacted by the state legislature. Hence, statement (2) is not true. Article 358 automatically suspends the fundamental rights under Article 19 as soon as the emergency is declared. On the other hand, Article 359 does not automatically suspend any Fundamental Right. Article 358 is confined to Fundamental Rights under Article 19 only whereas Article 359 extends to all those Fundamental Rights whose enforcement is suspended by the Presidential Order. Article 358 automatically suspends the fundamental rights under Article 19 as soon as the emergency is declared. On the other hand, Article 359 does not automatically suspend any Fundamental Right. It only empowers the president to suspend the enforcement of the specified Fundamental Rights. Article 358 operates only in case of External Emergency (that is, when the emergency is declared on the grounds of war or external aggression) and not in the case of Internal Emergency (ie, when the Emergency is declared on the ground of armed rebellion). Article 359, on the other hand, operates in case of both External Emergency as well as Internal Emergency. Article 358 suspends Fundamental Rights under Article 19 for the entire duration of Emergency while Article 359 suspends the enforcement of Fundamental Rights for a period specified by the president which may either be the entire duration of Emergency or a shorter period. Article 358 extends to the entire country whereas Article 359 may extend to the entire country or a part of it. Article 358 suspends Article 19 completely while Article 359 does not empower the suspension of the enforcement of Articles 20 and 21. Article 358 enables the State to make any law or take any executive action inconsistent with Fundamental Rights under Article 19 while Article 359 enables the State to make any law or take any executive action inconsistent with those Fundamental Rights whose enforcement is suspended by the Presidential Order. A judge of a high court can be removed in the same manner and on the same grounds as the judge of the Supreme Court. The salaries, allowances, privileges, leave and pension of the judges of a high court are determined from time to time by the Parliament. Every high court consists of a chief justice and such other judges as the President may from time to time deem necessary to appoint. The Chief Justice of India can transfer a judge from one high court to another after consulting the Chief Justice of respective high courts. Every high court (whether exclusive or common) consists of a chief justice and such other judges as the president may from time to time deem necessary to appoint. Thus, the Constitution does not specify the strength of a high court and leaves it to the discretion of the president. Accordingly, the President determines the strength of a high court from time to time depending upon its workload. A judge of a high court can be removed from his office by an order of the President. The President can issue the removal order only after an address by the Parliament has been presented to him in the same session for such removal. The address must be supported by a special majority of each House of Parliament (i.e., a majority of the total membership of that House and majority of not less than two-thirds of the members of that House present and voting). The grounds of removal are two—proved misbehaviour or incapacity. Thus, a judge of a high court can be removed in the same manner and on the same grounds as a judge of the Supreme Court. The President can transfer a judge from one high court to another after consulting the Chief Justice of India. Hence, statement (d) is not true. President determines the strength of the Supreme Court from time to time depending upon its workload. Parliament can confer on the Supreme courts the power to issue writs for issues other than Fundamental Rights. Which of the above given statement(s) is/are true? The original constitution had fixed sanctioned strength of the court at 8 and left the matter to parliament to increase the number of judges as needed by making a law [Supreme Court (Number of Judges) Amendment Act]. The number was increased to 11 in 1960, 14 in 1968, 18 in 1978, 26 in 1986 and 31 in 2009 (one chief justice and thirty other judges). Hence, statement (1) is wrong. The Constitution has constituted the Supreme Court as the guarantor and defender of the fundamental rights of the citizens. The Supreme Court is empowered to issue writs including habeas corpus, mandamus, prohibition, quo-warrento and certiorari for the enforcement of the fundamental rights of an aggrieved citizen. However, the Parliament can confer on the Supreme Court, the power to issue writs for other purposes also. Q.13) The Supreme Court held that a state government could be dismissed only under justifying circumstances and laid down guidelines for the same in which among the following judgment? There was widespread belief that imposition of President’s rule was more to do with the priorities of the Central government than the constitutional crisis. It can be passed by either House of Parliament only by a special majority. It may be revoked by the president and does not require the parliamentary approval. Article 360 empowers the president to proclaim a Financial Emergency if he is satisfied that a situation has arisen due to which the financial stability or credit of India or any part of its territory is threatened. A resolution approving the proclamation of financial emergency can be passed by either House of Parliament only by a simple majority, that is, a majority of the members of that house present and voting. A proclamation of Financial Emergency may be revoked by the president at anytime by a subsequent proclamation. Such a proclamation does not require the parliamentary approval. Q.15) Which of the following jurisdiction or power is exclusive to Supreme Court? A judge of the Supreme Court can be removed from his Office by an order of the president. The President can issue the removal order only after an address by Parliament has been presented to him in the same session for such removal. The address must be supported by a special majority of each House of Parliament (ie, a majority of the total membership of that House and a majority of not less than two-thirds of the members of that House present and voting). The grounds of removal are two—proved misbehaviour or incapacity. Q.17) Who does the President consult while appointing the judges of State high court? Q.18) Who among the following can be appointed as an acting Chief Justice of India by the President? the Chief Justice of India is unable to perform the duties of his office. He must have been either a judge of Supreme or High courts, or an advocate in the High courts. He is guaranteed security of tenure by the constitution of India considering the important duties that he performs. The grounds of removal of the AG are not mentioned in the constitution. The Attorney General (AG) is appointed by the president. He must be a person who is qualified to be appointed a judge of the Supreme Court. In other words, he must be a citizen of India and he must have been a judge of some high court for five years or an advocate of some high court for ten years or an eminent jurist, in the opinion of the president. The term of office of the AG is not fixed by the Constitution. Further, the Constitution does not contain the procedure and grounds for his removal. He holds office during the pleasure of the president. This means that he may be removed by the president at any time. He may also quit his office by submitting his resignation to the president. Conventionally, he resigns when the government (council of ministers) resigns or is replaced, as he is appointed on its advice. The remuneration of the AG is not fixed by the Constitution. He receives such remuneration as the president may determine. The salary and allowances of the Judges, the salaries, allowances and pensions of the staff as well as the administrative expenses of a high court are charged on the Consolidated Fund of the State. However, the pension of a high court judge is charged on the Consolidated Fund of India and not the state. Methane from gas hydrates may constitute a future source of natural gas. It is a body under Department of Science & Technology, Ministry of Science & Technology. The Indian Science Congress Association (ISCA) owes its origin to the foresight and initiative of two British Chemists, namely, Professor J. L. Simonsen and Professor P.S. MacMahon. The Ministry of Health & Family Welfare (MOHFW) has launched the Direct Benefit Transfer (DBT) scheme for nutritional support to tuberculosis patients as Nikshay Poshan Yojana (NPY). Flexibility of providing the benefit through existing bank account of a blood relative has also been given. State have also been advised to facilitate opening of zero balance accounts for TB patients, if necessary, under the Pradhan Mantri Jan Dhan Yojana (PMJDY) and Indian Postal Bank. The Midday Meal Scheme is covered by the National Food Security Act, 2013. The scheme guidelines envisage to provide cooked mid-day meal with 450 calories and 12 g of protein to every child at primary level and 700 calories and 20 g of protein at upper primary level. It is a common digital currency launched by the central banks of the United Arab Emirates (UAE) and Saudi Arabia. The Maraikkayars were seafarers from the Tamil country, and among them, the Kunjalis of the 16th century were renowned for their heroic naval battles with the Portuguese. Considered to be India’s first naval heroes, they led the native resistance on the seas against Portuguese invaders. Q.27) Which of the following correctly describe ‘hypsometry’, a term recently in news? It is essentially a graph that shows the proportion of air above water level. It is essentially a graph that shows the proportion of land area that exists at various elevations by plotting relative area against relative height. It is the study of underwater depth of lake or ocean floors. It is the science of measurement and description of features which affect maritime navigation, marine construction, dredging, offshore oil exploration/offshore oil drilling and related activities. Hypsometry or Hypsometry Curve– It is essentially a graph that shows the proportion of land area that exists at various elevations by plotting relative area against relative height. Bathymetry is the study of underwater depth of lake or ocean floors. In other words, bathymetry is the underwater equivalent to hypsometry or topography. It is named after British economist William Beveridge. The Beveridge curve usually slopes downwards because times when there is high job vacancy in an economy are also marked by relatively low unemployment since companies may actually be actively looking to hire new people. By the same logic, a low job vacancy rate usually corresponds with high unemployment as companies may not be looking to hire many people in new jobs. It is a physiological theory that pertains to average life span of an individual across the World. It is a controversial theory that promotes population explosion. It is an economic theory that pertains to the spending and saving habits of people over the course of a lifetime. The concept was developed by Franco Modigliani and his student Richard Brumberg. LCH presumes that individuals plan their spending over their lifetimes, taking into account their future income. Accordingly, they take on debt when they are young, assuming future income will enable them to pay the debt off. They then save during middle age in order to maintain their level of consumption when they retire. This results in a “hump-shaped” pattern in which wealth accumulation is low during youth and old age, and high during middle age. The Great Living Chola Temples were built by kings of the Chola Empire, which stretched over all of south India and the neighbouring islands. The site includes three great 11th- and 12th-century Temples: the Brihadisvara Temple at Thanjavur, the Brihadisvara Temple at Gangaikondacholisvaram and the Airavatesvara Temple at Darasuram. The Brihadisvara temple at Tanjavur marks the greatest achievement of the Chola architects. Known in the inscriptions as Dakshina Meru, the construction of this temple was inaugurated by the Chola King, Rajaraja I. It included gopura, the main temple, its massive tower, inscriptions, frescoes and sculptures predominantly related to Shaivism, but also of Vaishnvaism and Shaktism traditions of Hinduism. The Airavatesvara temple at Tanjavur was built by the Chola king Rajaraja II. The temple is dedicated to Shiva. It also reverentially displays Vaishnavism and Shaktism traditions of Hinduism, along with the legends associated with sixty three Nayanars – the Bhakti movement saints of Shaivism. The Brihadisvara temple at Gangaikondacholapuram in the Perambalur district was built for Siva by Rajendra Chola I. It is dedicated to Shiva and based on a square plan, but the temple reverentially displays Vaishnavism, Shaktism and syncretic equivalence themes of Hinduism with statues of Vishnu, Durga, Surya, Harihara, Ardhanishvara, and others.